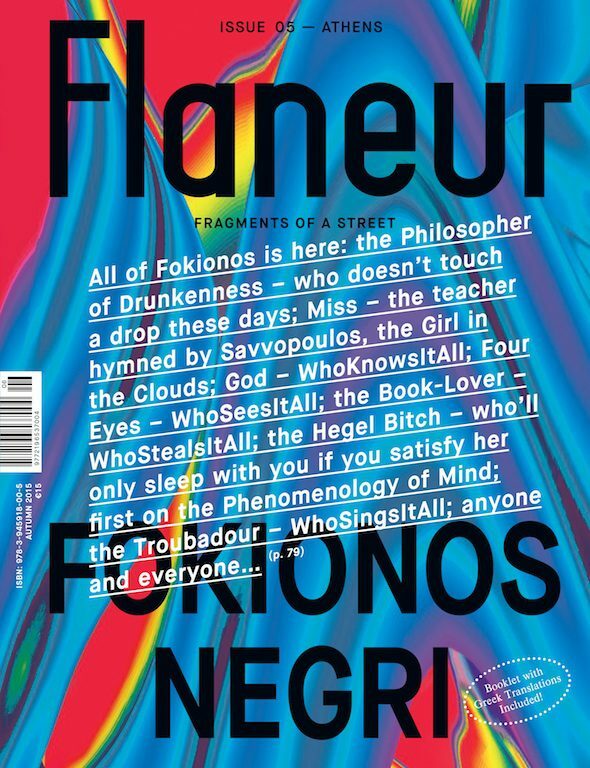 Flaneur is a magazine that’s not really a magazine. A collection of literary, photographic and artistic ‘fragments’, each issue focuses on a single street in a different city. How does a street become an intersection, a meeting point or physical manifestation of the stories that have happened there? How can we escape the idea of the linearity of a street, taking into account the layers of history we see there? Each issue is put together collaboratively, after conversation between the contributors, designers and editors. As such, each story takes on a completely different form, in format, content and aesthetic. 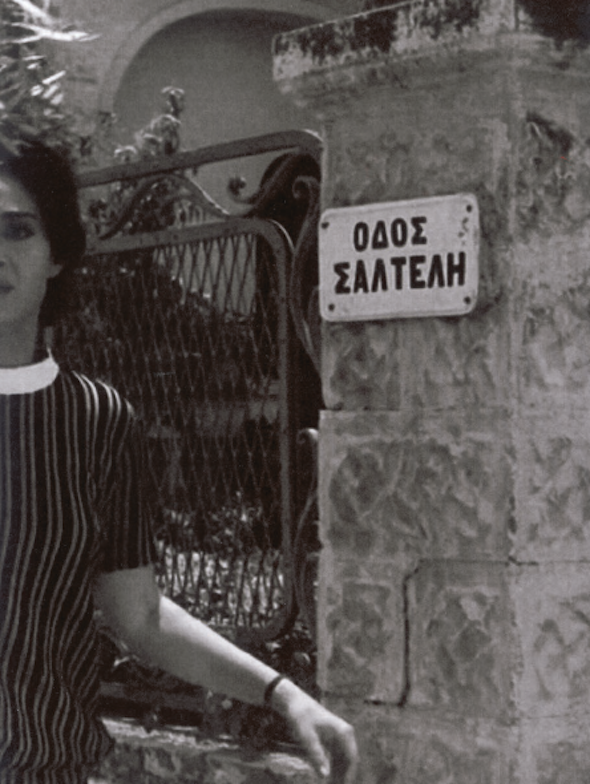 This issue takes its starting point as the residential street of Fokionos Negri in Athens, and celebrates its launch at Greek café Bitte in Kreuzberg on Saturday 3 October. In the issue, portraits of the street’s citizens rubs pages with artist Iris Touliatou’s imagined forum of scent-hallucinators inspired by the street and a photographic exploration of the scenography of the entrance hall. The editors in chief, Grashina Gabelmann and Fabian Saul, are based in Berlin, when they’re not visiting other cities for research purposes, as are their design team, Yukiko. 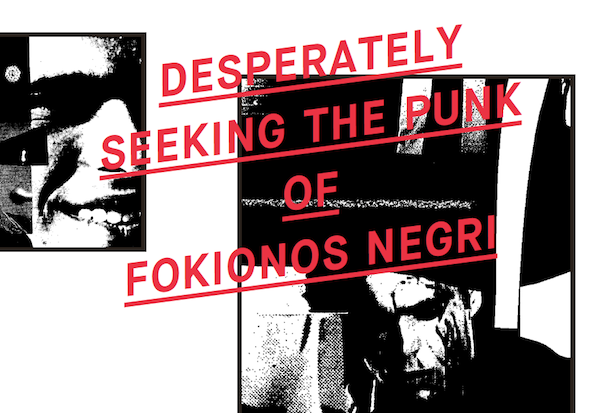 We spoke to them about the idea behind their magazine, how much the Greek crisis affected the magazine and whether their work really constitutes a magazine at all. Josie Thaddeus-Johns: What’s the idea behind Flaneur? Fabian Saul: Flaneur is a magazine that deals with one street per issue. That means we go there for two months. The idea was to do a magazine that focuses on a microcosm and to break up the idea that the street is something linear, and see it as something that unfolds as you dive into it: there’s many hidden layers that you can reveal. So the idea is to present these fragments that are not a guide to the street, but a very subjective perspective – it’s a multi-perspective project. That’s the distinction between this and a travel mag. Grashina Gabelmann: The collaborative aspect is very important. I’m finding more and more that the magazine is able to even create a community around it. We don’t reprint anything, everything is made for the magazine and we work very closely together with the artists, there are a lot of meetings and back and forth and the artist will be in touch with the designers. So it’s a very communicative and collaborative project. JTJ: How did this working attitude develop? FS: We didn’t have a master plan. All decisions in the magazine are quite intuitive. The title Flaneur also relates to how we work. When we start, we don’t know the structure, we put together fragments while we work. Half the time we don’t know what’s going on! That’s quite unusual and also what leads to an unusual design: each piece is its own project. Before we go, we don’t research, we don’t know what we want to get. We don’t even know the street. We walk the city. In this case, we took two weeks to pick Fokionos Negri. JTJ: How much did the Greek crisis affect this issue? FS: I mean, there’s a piece called “God Bless Tsipras” that’s quite political! But, I never felt like that was the dominating subject while we were there. It was one layer of what’s going on, but life continues and there are many layers of what people experience. It’s a media generated belief that because the crisis happened, everything that happened before is cancelled. You get the idea when you watch the news these days that everybody is always in demonstration mode. It sounded like a civil war, which is not the case. Athens has big problems because of the crisis, of course. We’re aware of that, but it’s still one layer of what’s going on and not the only one. We didn’t let it dominate the narrative but it’s in there somewhere, we’re not ignoring it. GG: We could have had it dominate if we’d chosen a different street. That was a decision at the beginning. [Fokionos Negri] is a residential street. On the sidewalks there are probably 45 cafes on the street, and less than ten shops. You can’t even imagine that each cafe can be filled with people, but it’s partly because people don’t have jobs. FS: In Athens being part of public life is much more important. The area around it, Kypseli, is one of the most densely populated areas in Europe, so people have come from the whole neighbourhood. It has a lot of social symbolism, rather than political. It’s important for teenagers, for example. It’s a real walking street, a real flaneur place. JTJ: How much of a connection is there from issue to issue? Your last issue was Rome, and now you’ve chosen Athens – it seems like there’s a link between these centres of antiquity? FS: It looks very connected but they’re not at all. As part of the Western world, we have this big narrative of this golden Athens in antiquity and when you go there, you find that Athens is a city of modernity. There is a narrative that you have to be aware of and also resist because it’s very dangerous to reduce Athens to the Acropolis. There’s a huge ignorance towards any other culture that doesn’t fit that narrative, both in Rome and Athens, and that is made mostly by other European countries which want to use that for their own power claims. JTJ: Do you really see Flaneur as a magazine? A lot of the things you’re saying sound like you’re rejecting traditional journalistic strategies? GG: I see it less and less as a magazine, the more we do it. It’s a container for things. We have this very rigid idea of what a magazine is, and it doesn’t have to be that. It’s just a case to hold everything we’re doing and I am realising more and more that the other things we’re doing play into that. We also have this thing that we’re trying to establish called “unprintables”: pieces of work that either started out in a non-printed format, for example a performance we did in Rome, which we documented on video and we turned it into something that could be shown in a printed format. Then on our website you can watch the documentary of it. That’s a good example of the transformation of a performance to a documentary to something that’s in the magazine. Or for the Rome issue, we put together a fake panel discussion. There was an actual panel discussion in the 19th century with 11 people discussing the future of modern Rome and we recreated that panel but never actually got the people to meet. So we got all these people to contribute, which ranged from dialogues to performance pieces to essays. Fabian and I cut everything up and reassembled it and made it seem like there was a discussion going on. Now in two weeks we want to have an actual discussion, so that’s taking the magazine and taking it back to real life in another format. FS: I think in that way, once the magazine’s out, it kind of takes on a life of its own. I think that this is the main difference to a typical magazine – we think of the magazine as something contemporary. We think of [Flaneur] as something similar to a book, with a timeless character. Now we have an ISBN instead of an ISSN, we’re seeing the magazine more and more as hopefully something that lasts as long as a book.